In the current market scenario, it’s tough for anyone to bet that a stock will rise by even a few percentage points in the future. When capital gains in the equity market are so uncertain, investors may want to park their money in an FD, which yields on an average 9% pre-tax and 6.3% post-tax interest. However, in certain cases, investing in stocks from a purely dividend point of view can generate better returns in the long run than investing in the seemingly high interestpaying FDs. Let’s suppose a stock is trading at a dividend yield of 5% and its profit is likely to grow at 20% per annum for the next few years. In such a case, the return from dividend will be more than the post-tax interest on FD in less than four years. Here, we must realise that dividends are tax-free, while interest on FD attracts 30% tax for those in the highest income bracket. It's current dividend yield is 9%. The company has maintained a consistent payout ratio of 35-40%, and its earnings have grown at around 60% per annum in the past five years. Hence, investing in this stock purely from a dividend perspective is much better than investing in an FD. Varun Shipping’s business is largely insulated from the slowdown in the day rates of crude tankers and dry bulk carriers as the company is in the LPG segment and provides vessels to support offshore oil exploration. Also, its profit is expected to surge as the company is increasing its fleet size of high-margin offshore supply vessels. Another stock in our list with a high dividend yield of 8.2%. The company owns one of the most complex petroleum refineries in India, which provides visibility about its growth prospects as the demand for oil is sticky. Moreover, being a refinery has actually helped CPCL in the rising crude price scenario, which is not the case with exploration and production companies like ONGC. In FY08, CPCL’s dividend payment in rupee terms surged 40% after its net profit almost doubled due to high gross refining margins. The company’s dividend has kept pace with net profit in the past as well, which shows that the management considers dividend as a means to reward shareholders. Another company which looks attractive with a current dividend yield of 7.7%. 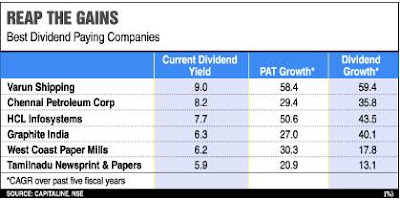 Though there has been no growth in its dividend in the past few years, its current dividend yield makes it a much better investment than FDs. Moreover, the company is foraying into systems integration, which is a services domain, and the margins in this business are higher than those in the hardware business in which the company currently operates. This shows that there’s likely to be considerable improvement in the company’s bottomline, which may result in dividend growth as well. Comes close on the heels of HCL Infosystems with a dividend yield of 6.3%. The company manufactures graphite electrodes & anodes, miscellaneous graphite and carbon products, and is one of the largest manufacturers of such products in the world. The technology to manufacture such products is closely guarded and hence, acts as a potent entry barrier. Such products are used in the steel industry and it is estimated that the production capacity of steel in India needs to be scaled up in the next 2-3 years, which provides growth visibility for Graphite India. Has also been paying dividends consistently. Its current dividend yield stands at 6.2%. The company raised money last year for expansion as it aims to increase its capacity by 80% in the next few years. This will increase its bottomline, thereby resulting in higher dividend payouts. This bagasse-based paper manufacturer has a current dividend yield of 5.9%. The company has a consistent track record of dividend payment. Though the compound annual growth rate (CAGR) in dividends over the past four years is a modest 13%, its dividends are likely to grow at higher rates, given the bullishness in paper prices and the company’s investments towards capacity expansion. The above-mentioned companies have a history of active dividend policy and are likely to grow at very high rates in future. Also, stocks with high dividend yield are the first ones to appreciate in a bull run. Think for yourself. Invest wisely! Happy Investing! !